The Philippine Army (PA; Filipino: Hukbong Katihan ng Pilipinas) is the main, oldest and largest branch of the Armed Forces of the Philippines (AFP) responsible for ground warfare. The Commanding General of the Philippine Army, its professional and overall head, is Lieutenant General Macairog S. Alberto, who took office on October 15, 2018. Its main headquarters is located at Fort Bonifacio, Metro Manila. "Serving the people. Securing the land. Perform such functions as the higher authorities may direct. After three centuries of Spanish rule, there were calls for social reforms and an end to the perceived oppressive friar rule. In 1896, Andres Bonifacio founded the Katipunan to prepare his band of Filipinos for armed revolt against the Spanish government. The Katipunan formed an army of insurgents. Almost a year after the outbreak of hostilities between the Katipuneros and the Spanish troops, Emilio Aguinaldo's Philippine Revolutionary Government and its Army were born on March 22, 1897 at Tejeros, San Francisco de Malabon in Cavite. General Artemio Ricarte was named Captain General of the Ejercito en la Republica de las Islas Filipinas or the revolutionary Philippine Army. This date marks the founding day of the modern day Philippine Army. On June 12, 1898, General Emilio Aguinaldo declared Philippine Independence from Spain and formed the first Philippine Republic, in which he sat as its president. 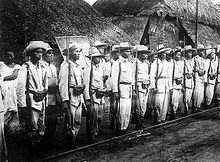 The Filipino troops were to enjoy only a brief respite from combat when American forces came in to establish rule in the islands by virtue of the Treaty of Paris, which Spain co-signed with America on 10 December 1898. The treaty ceded the Philippines to the United States. During the final years of the Philippine–American War, with the notable successes by the all-Filipino Macabebe Scouts cavalry squadron (raised in 1899) under U.S. command against the Philippine Revolutionary Army (PRA), the American President Theodore Roosevelt officially sanctioned the raising of the Philippine Scouts (PS) as part of the United States Army, with full effect starting from October 1901. Earlier, in August that same year, came the colonial civil government's decision to found the Philippine Constabulary (PC) as the national gendarmerie force for law enforcement. Both of these organizations and their victories over the PRA contributed to the official end of the conflict in 1902, even as resistance continued (inclusive of the Muslims of the south, resulting in the Moro Rebellion) through 1914. Starting in 1910, Filipino personnel in the Philippine Scouts were sent to the United States Military Academy with one PS soldier being sent per year. Several of these graduates who served with the Scouts, plus PC officers, both formed part of the first officer corps of the revitalized Philippine Army established in 1935. The Philippine Army of today was initially organized under the National Defense Act of 1935 (Commonwealth Act No. 1) that formally created the Armed Forces of the Philippines. The act specified that in so far as may be practicable, original appointments by the President in grades above third lieutenant should be made from among former holders of reserve commissions in the United States Army, from among former officers of the Philippine Scouts and Constabulary. After the establishment of the Philippine Commonwealth on November 15, 1935, President Manuel L. Quezon sought the services of General Douglas MacArthur to evolve a national defense plan. The official rebirth of the Philippine Army occurred with the passage of Commonwealth Act No. 1, approved on December 21, 1935, which effected the organization of a Council of National Defense and of the Army of the Philippines. The act set forth the organizational structure of the army in some detail, set forth enlistment procedures, and established mobilization procedures. With this act, the AFP was officially established. The development of the new Philippine Army was slow. The year 1936 was devoted to the building of camps, organization of cadres, and the special training of instructors, drawn largely from the Constabulary, which joined the new force as the Constabulary Division. The commander of the Philippine Department provided Philippine Scouts as instructors and detailed U.S. Army officers to assist in the inspection, instruction, and administration of the program. By the end of the year instructors had been trained and camps established. The first group of 20,000 men was called up on January 1, 1937; and by the end of 1939 there were 4,800 officers and 104,000 men in the reserves. Infantry training was given at camps scattered throughout the Philippines; field artillery training was concentrated in the vicinity of the U.S. Army's Fort Stotsenburg near Angeles, about fifty miles north of Manila, and specialized training was given at Fort William McKinley just south of Manila. Coast artillery instruction was carried on at Fort Stotsenburg and at Grande Island in Subic Bay by personnel supplied largely by the American commander at Corregidor. A decade later, with the threat of war with Japan becoming imminent, on July 26, 1941 a new U.S. command in the Far East was created, known as the United States Army Forces Far East (USAFFE) under the command of General MacArthur. On the same date, U.S. President Franklin D. Roosevelt, issued a Presidential Order (6 Fed. Reg. 3825) which called the Philippine Army into the service of the Armed Forces of the United States. The Presidential Order did not order all the military forces of the Philippine government into the service of the United States Armed Forces; only those units and personnel indicated in orders issued by a general officer of the United States Army were mobilized and made an integral part of the United States Army Forces Far East (USAFFE), and only those members of a unit who physically reported for duty were inducted. With an annual appropriation of 16 million pesos, the mobilized units trained new Filipino members in defending the nation and protecting its people. Philippine Scouts operating a 37-mm anti-tank gun at Fort McKinley. When World War II broke out in 1941, two regular and ten reserve divisions of the Philippine Army undertook the defense of the Philippines. These divisions were incorporated into the United States Armed Forces in the Far East (USAFFE) under the command of General MacArthur. Japanese forces invaded the Philippines after the bombing of Pearl Harbor on the island of Oahu on 7 December 1941. At this time, two regular and ten reserve divisions of the Philippine Army undertook the defense of the Philippines. This included North Luzon Force (under then Major General Jonathan M. Wainwright), South Luzon Force activated 13 December 1941 under Brig. Gen. George M. Parker Jr., the Visayan-Mindanao Force under Colonel W.F. Sharp in the southern islands (61st, 81st, and 101st Divisions plus three other regiments), and the Reserve Force. North Luzon Force included the 11th, 21st, and 31st Divisions, all reserve. South Luzon Force include the 1st (regular) Division, and the 41st, 51st, and 71st (reserve) Divisions. These divisions were incorporated into the United States Army Forces in the Far East (USAFFE). The equipment of these units included: Renault FT tank (prewar training only); 75mm SPM (manned by PA and PS personnel); Canon de 155 mm GPF; Canon de 155 C modèle 1917 Schneider 75 mm Gun M1917; 2.95 inch QF Mountain gun; 3-inch gun; 6-pounder naval gun; Stokes Mortar; Brandt mle 27/31; Canon d'Infanterie de 37 modèle 1916 TRP; M2 Browning machine gun; M1917 Browning machine gun; M1919 Browning machine gun; M1918 Browning Automatic Rifle; M1917 Enfield rifle; M1903 Springfield rifle; Thompson submachine gun; and the M1911 pistol. After the Battle of Bataan, the Japanese began the siege and Battle of Corregidor. Defending forces included regiments of the Harbor Defenses of Manila and Subic Bays, the 4th Marine Regiment and other Philippine, U.S. Army and Navy units and soldiers. Japanese forces landed at Corregidor on May 5, 1942. The island's fall led to the surrender of all defending Filipino and American forces on May 6, 1942. About 4,000 of the 11,000 American and Filipino prisoners of war from the island were marched through the streets of Manila to incarceration at Fort Santiago in Intramuros and Bilibid Prison in Muntinlupa, Rizal, which had become Japanese camps. With the fall of Corregidor, Filipino and U.S. forces under U.S. command surrendered. After the surrender, thousands of Filipinos formerly under U.S. command (especially the former Visayan-Mindanao Force, which had seen little combat) evaded Japanese confinement and hid in the jungle. Every major island had guerrilla groups; Luzon had a dozen, including the Communist Huks. After initial clashes based on religious and political rivalries order was gradually restored, with most willing to trust the United States to grant independence in time. Many of these groups worked under the control of General Douglas MacArthur's General Headquarters, Southwest Pacific Area. The Japanese occupation of the Philippines saw repeated combat between the Japanese imperial forces, their collaborators and Filipino guerrillas. The American and Allied liberation force which began landing on October 17, 1944 was aided by local Filipino soldiers and recognized guerrillas in the liberation of the Philippines. President Sergio Osmeña and Major General Basilio J. Valdes ordered the re-establishment of the army. The general headquarters of the Philippine Army and the United States Army Forces in the Far East moved to Tacloban, Leyte on October 23. From October 17, 1944 to September 2, 1945, local Philippine Constabulary troops, guerrilla units and the American liberation forces fought Imperial Japanese and Kempeitai troops which were supported by the Bureau of Constabulary and Makapili militia. After the restoration of the Commonwealth of the Philippines on October 20, 1944, President Sergio Osmena, the government, military officials and cabinet returned from exile in the United States. After the war, four military areas were activated to take the place of military districts. The Armed Forces was reorganized which gave birth to the four major services of the Armed Forces. Headquarters National Defense Forces was renamed General Headquarters Armed Forces of the Philippines. Philippine Army Special Operations Command (SOCOM) operators with Special Operations Command, stationed at Fort Magsaysay. Philippine Army SSG Manolo Martin demonstrates the proper method of holding a cobra during a survival course in the Balikatan Exercise 2008. Service of the Philippine Army as part of the United States Army terminated as of midnight, June 30, 1946, by authority of General Order #168, U.S. Army Forces, Western Pacific. The next day, on July 1, President Manuel Roxas issued Executive Order No. 94 s. 1947 which, among other things, reorganized the Philippine Army into a service branch of what was now called the Armed Forces of the Philippines. This resulted in the formation of the Philippine Air Force and reformation of the Philippine Navy as separate organizations after long years as part of the Philippine Army. In the early fifties and the mid-sixties, the Philippine government extended a helping hand to war-torn countries as part of its commitment as member of the United Nations. 1950 would see the new army not just fighting Communist groups in Luzon but from August of that year, even the Korean People's Army and their allies in the People's Liberation Army in the Korean War as PA Battalion Combat Teams (BCTs) forming the bulk of the Philippine Expeditionary Forces to Korea formed part of the UN forces, led by the US, that fought in the conflict. The decade saw the raising of the first active division of the Army, the 1st Infantry Division. With the victory over the Huks later in the 50s, the BCTs became active duty infantry battalions. Formed in the same time was the 1st Scout Ranger Regiment, and in 1962 the PA raised its airborne and special forces formation, the Special Forces Regiment (Airborne) following the traditions of the US Army Special Forces (the Green Berets) and the 11th Airborne Division that helped liberate Southern Luzon and Manila at the closing stages of the Japanese occupation of the country. It would only take until the 1970s and the Communist and Muslim rebellions that would force the PA into the establishment of its 2nd Infantry Division, which led to the raising of more infantry divisions all over the country, as well as the formal raising of the Army's Special Operations Command and what is now today the Mechanized Infantry Division. The Philippine Army has several regular units dedicated to counter-insurgency and conventional army operations. Training and Doctrine Command - Training Command, Philippine Army, established 1986, was reorganised as TRADOC effective March 1, 1995. This is a list of all Philippine Army bases in the Philippines. Camp Gen. Macario G. Peralta, Jr.
Camp Francisco C. Fernandez Jr.
Camp Fermin G. Lira, Jr.
Camp General Manuel T. Yan Sr. The army employs various individual weapons to provide light firepower at short ranges. The army also employs various crew-served weapons to provide heavy firepower at ranges exceeding that of individual weapons. Elbit Systems was awarded to upgrade the Mechanized Infantry Division's M113A2 fleet, with 44 units to be installed with the Elbit Dragon 12.7mm RCWS, while 5 units will be converted to self propelled mortar carriers with an 81mm Soltam Cardom mortar system. Delivery will start and be completed within 2019. As of 27 April 2018, negotiations are ongoing for the donation of 2 Bell AH-1F Cobra attack helicopters and several dozen M113A2 armored personnel carriers from the Kingdom of Jordan to help the Philippine Government combat ISIL terrorists..
A joint purchase with the Philippine Marine Corps for around 50,000 new rifles based on the M4 and 5,500 close combat optics is underway, to replace the older M16A1 still in service on both armed forces branches. On May 4, 2013, the Department of National Defense (DND) has declared the United States-based Remington company the winning bidder to supply 50,629 pieces of M4 rifles, according to the Philippine representative of the company. On Dec 2, 2013 Remington announced that it has been awarded, a $47 million initial contract, to supply and deliver R4 carbines with accessories and training by the AFP. On 18 March 2014, the Philippine Army confirmed the purchase of 63,000 new-built M4 carbines for ₱2.4 billion, with the rifles costing ₱38,402 each. The M4s are part of an effort to replace the Army's Vietnam-era automatic rifles. July 2014, deliveries have begun. In December 2015, the delivery of M4 rifles was completed. In January 2014, the Philippine Army ordered 400 Airtronic RPG-7s from the United States to replace their obsolete M18 and M67 recoilless rifles. The Airtronic RPG-7 is 60 percent lighter than the recoilless rifles and deliveries are to be completed by the end of the year. Another order of 744 RPG-7Bs, this time from Russia's Rosoboronexport, was made by the DND in a contract worth P408 million. A previous requirement for 100 units of 81 mm mortar, 335 units of rocket launchers/light anti-tank weapons, 18 units 155 mm towed howitzers with 5-ton truck prime movers was announced in 2008. plus night fighting systems. The Serbian-made M69B 81 mm mortar was selected for the mortar requirement which were completely delivered in 2013, while the 155 mm towed howitzers requirements were revised. The acquisition for shoulder fired rocket launchers and night fighting systems are still in process. A plan to acquire 100 M113-derived VCC-1 APCs and 25 FH-70 155 mm howitzers from Italy as part of a deal for further purchase of Italian armaments was announced in November, 2012. The FH-70 were supposed to fill in the 155 mm towed howitzer requirement announced as early as 2008. But this plan was cancelled as the package to acquire used Italian arms did not materialize. In December 2013, an announcement for public bidding to purchase ₱700 million worth of howitzers and ammunition was made. This is to replace FH-70s included in the canceled Italian arms package deal. The acquisition consists of 12 units of 155 mm Towed Howitzer (6 for the Army, 6 for the Marine Corps) and 240 rounds of 155 mm High Explosive (HE) ammunition rounds with an approved budget of ₱438.6 million. The other project, which has a budget of ₱303.8 million, is for acquisition of 5,990 nos. of 25 mm rounds, 43,578 nos. of 40 mm rounds, and 4,500 nos. of 105 mm howitzer ammunition and other explosives. The Department of National Defense opened the bidding for 12 units of 155 mm howitzers and 240 rounds of projectiles worth of ₱438.6 million. The acquisition will boost the existing howitzers in its inventory but were outdated. On 1 April 2014, Israeli company Elbit Systems won the bid and will deliver 12 Soltam ATHOS towed artillery pieces. The DND plans to acquire a shore-based missile system with a budget of ₱6.5 billion that will be placed under the control and supervision of the Army. It will consist of 12 launchers with its attendant trailers and tracking systems plus the missiles themselves. These shore-to-ship missiles could be fired to hit naval or other sea-based targets. The DND has shown interest to purchase of surface-to-air missiles from Israel for the Philippine Army. Offers were made by Israel-based companies Rafael Advanced Defense Systems Ltd. and Israel Military Industries Ltd. The DND is also interested to acquire the HAWK-5 variant of Raytheon Corporation's MIM-23 HAWK SAM system to complement and protect the shore-to-ship launchers the government plans to acquire. The Philippine Army has allotted 1.5 million pesos for its development of its 3rd Unmanned Aerial Vehicle (UAV). The UAV will be an enhanced version of the Philippine Army's first two drones, the "Raptor" and the "Knight Falcon". It was reported that the Philippine Army is planning to acquire ₱530 million worth of disaster response equipment that includes 6 units of road rollers, 30 units of dump trucks, 14 units of excavators, 8 units of road graders, and 12 units of dozers. Another joint purchase with the Philippine Marine Corps is for around 44,000 new body armor or force protection equipment, composed of a basic vest, plate inserts and a soft ballistic panel and weighing between 5.8 and 6.8 kg. Wikimedia Commons has media related to Philippine Army. ^ "Death Toll For U.S.-Led Coalition in Iraq". CNN. July 9, 2004. Archived from the original on December 4, 2008. Retrieved July 4, 2008. ^ "Mission of the Philippine Army". Philippine Army Website. Archived from the original on 18 August 2013. Retrieved 17 July 2013. ^ a b Jose, Ricardo Trota (1992). The Philippine Army: 1935–1942. Ateneo University Press. pp. 23–49. ISBN 978-971-550-081-4. Archived from the original on 2014-01-11. Retrieved 2016-08-05. ^ "Commonwealth Act No. 1". Philippine Laws, Statutes, and Codes. Chan Robles Law Library. December 21, 1935. Archived from the original on January 13, 2009. Retrieved October 27, 2009. ^ Jose 1992, pp. 191–210. ^ a b "Philippine Army and Guerrilla Records". National Archives and Records Administration. 3 July 2013. Archived from the original on 24 December 2014. Retrieved 24 December 2014. ^ Leo Niehorster, North Luzon Force Archived 2016-03-05 at the Wayback Machine, accessed January 2014. See also Major Rolando Pesano, 'A Brief History of the 31st Division, Philippine Army.' Brig Gen William E. Brougher was assigned to command the 11th Division in September 1941. ^ Jose 1992, pp. 210–214. ^ Michael Wright, "The World at Arms: The Reader's Digest Illustrated History of World War II" Reader’s Digest, 1989, 384. ^ "Executive Order No. 94 s. 1947". Official Gazette of the Philippines. Archived from the original on 2013-11-24. Retrieved 2013-07-03. ^ "Mechanized Infantry Division website". OG6, CISO, MECH DIV PA. Archived from the original on 2013-07-23. Retrieved 2013-08-30. ^ "ELBIT SYSTEMS WINS CONTRACT TO UPGRADE PHILIPPINE ARMY M113A2 WITH RCWS AND MORTARS". MaxDefense Philippines. 2018-06-14. Archived from the original on 2018-06-27. Retrieved 2018-08-05. ^ "US-based Remington wins bid to supply 50,000 M4 rifles for AFP, company rep says". InterAksyon.com. Archived from the original on 2013-05-06. ^ "Philippine Military Awards Rifle Contract to Remington Defense". The Outdoor Wire. 2013-12-02. Archived from the original on 2013-12-11. Retrieved 2013-12-08. ^ "Remington R4 Adopted By Philippine Army – The Firearm Blog". The Firearm Blog. Archived from the original on 13 August 2014. Retrieved 24 December 2014. ^ Aurelio, Julie (11 January 2016). "Final delivery of 12,000 M4 carbine rifles now with AFP". Inquirer. Archived from the original on 13 January 2016. Retrieved 6 May 2016. ^ "Russia and Philippines sign contract for delivery of grenade launchers". TASS Russian News Agency. 2017-10-24. Archived from the original on 2018-08-05. Retrieved 2018-08-05. ^ "Philippines could breach US sanctions if Russia arms deal proceeds". ABS-CBN News. 2018-07-18. Archived from the original on 2018-08-05. Retrieved 2018-08-05. ^ "Invitation to Bid for 81 mm Mortar Acquisition Project" (PDF). Department of National Defense (Philippines). 2010-01-01. Archived from the original (PDF) on 2014-01-15. Retrieved 2013-04-27. ^ "Army chief unveils more gear for troops". ABS-CBN News. 2011-03-22. Archived from the original on 2015-02-23. Retrieved 2013-04-27. ^ "Philippines Army increases its fire support capability with new Serbian-made 81 mm mortar 2312133 – Army Recognition". Archived from the original on 23 September 2015. Retrieved 24 December 2014. ^ "DND eyes 100 new APCs from Italy". Archived from the original on 2013-01-06. Retrieved 2013-01-04. ^ "DND to purchase P438-M cannons". ABS-CBN News. Archived from the original on 2014-05-01. Retrieved 2014-03-06. ^ "Defense set to acquire P700-M howitzers, ammunitions". ABS-CBN News. 2013-12-01. Archived from the original on 2013-12-08. Retrieved 2013-12-08. ^ "PHL to acquire shore-based missile system". ZamboTimes. 2013-12-04. Archived from the original on 2013-12-11. Retrieved 2013-12-08. ^ a b "Gov't eyes enhanced HAWK surface-to-air missiles". Manila Bulletin. 2014-03-31. Archived from the original on 2014-03-31. Retrieved 2014-03-31. ^ "AFP chief leads pledge to defend sovereignty amid internal, external challenges". June 12, 2013. Archived from the original on June 15, 2013. ^ "PH plans to tap Israel for missile launchers". Manila Standard Today. Archived from the original on June 18, 2013. Retrieved June 15, 2013. ^ Mallari, Mario J. (2013-12-21). "Army allots P1.5M for dev't of its own drone". The Daily Tribune. Archived from the original on 2013-12-22. Retrieved 2013-12-21. ^ "Army to buy P530-M disaster response equipment". The Philippine Star. 2014-01-21. Archived from the original on 2014-03-06. Retrieved 2014-02-22. ^ "DND to purchase P1.7-B worth of body armors". ABS-CBN News. 2013-02-07. Archived from the original on 2013-02-14. Retrieved 2013-04-27. ^ "DND wants US testing for soldiers' protection kits". Business Mirror. 2013-03-31. Archived from the original on 2013-05-18. Retrieved 2013-04-27.